Open sites without any protection against strong winds may be OK in the South of England. However in the North of England and Scotland, where the temperatures are already lower and the winds even stronger, compared with the South, the tree may survive, but regular crops are unlikely to be achieved. However it is amazing what can be done if some sort of shelter is available, such as planting along a south or east facing wall or behind a tall hedge or a row of trees acting as a windbreak, for the area where the fruit trees are planted. However leave enough room as a headland, as fruit trees do not like to grow in the shade of other taller trees, neither do they like being planted on top of live roots of already existing trees in the surrounding area. It is of great importance that where winds can be strong, the trees are properly staked and well secured with an adjustable tie. The stakes need to be planted in an upright fashion and be 6 foot in length and round with a diameter of 2 inches. Unless planted in a walled garden, the best rootstock for open sites is MM106. Secondly, valleys collect cold air and often lead to spring frosts at the time fruit trees are in blossom. The prospects of a decent crop will be diminishing with every spring frost in the period from late March to the end of May. For that reason try to plant further up the slope, where the air is warmer. If there is a hedge or a dense row of trees that stops the cold air from draining away, a 3 to 4 metre gap should be created at the lowest point in the hedge. Summarizing, fruit trees do best if planted at a site with a good micro climate of relative warmth and shelter. 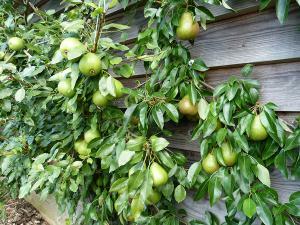 Valleys collect cold air and are therefore risky sites for fruit trees. This is linked to the possibility of serious frost damage to fruit tree blossoms in the period from April to May.